In fact the ingredients of shampoo aren’t that significant, but the different hair washing method could cause the bad hair. ■ Step 1: Before shampooing hair, clean the dirty scalp and scaly dead cells. ■ Step 2: Wet your hair all over from the bottom to the upper layer of the hair. Pour the shampoo into the palm. Dilute with water and create bubble. Do not pour shampoo directly on the hair. It would over-stimulate the scalp and result in dandruff. ■ Step 3: Use finger pulps to evenly rub the shampoo into the hair. Massage gently until a thick layer of foam created. 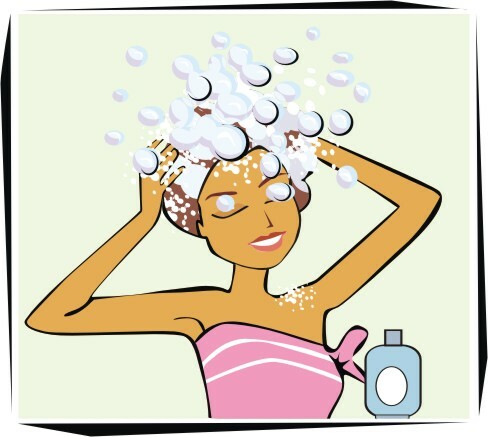 ■ Step 4: Rinse your hair until it is thoroughly clean. Then once again use a teaspoon of shampoo and add water to gently rub the scalp. This time is to clean the hair root, and then rinse away. ■ Step 5: Rinse and wipe from the scalp to the hair tail, gently massage, and then wash away completely. ■ Step 6: The hair is most vulnerable when it is wet. If you rub hard to dry, it would cause hair breakage or knot. After washing, it is best to dry with a towel, comb hair to forward with a wide-tooth comb. Blow dry with a hair dryer from the hair root to hair tail, to have less hair burned. When blowing hair, use your hair dryers 5 cm far away from the hair to keep hair from too dry. Deep conditioning treatment time: about once or twice a week. Every time before the deep conditioning treatment, the most importance is to make the hair back to clean and no burden condition. It is recommended to use the "deep clean" shampoo to remove the accumulated chemical residue. The chemical residue on the hair would affect the nutrient absorption, and reduce the effects of conditioning. * The professional salon would use the "deep cleaning" shampoo before the conditioner treatment. After hair washing, begin to use hair products and spread evenly throughout the head. * General hair care products contain all of the nutrients needed. But please note that if it is hot dry hair being stained or damaged, the hair needs more moisture to nourish. It is best to supply the hair with moisture hair care products. Put the hair care product on evenly; wait for 10 to 15 minutes. The hair care product nutrients can be absorbed. Previously, hair care products need to be heated auxiliary for the good results. But the current hair care products are free from heating and can reach deep nourishing effect. If you still use heat hair care products. Do not doubt. Hurry up with your hair cap to heat up. * If you do not have hair cap, how to deal with that? We recommend you to prepare plastic wrap the entire hair, keep the heat on the head. It can also help prevent dripping all over the floor. It’s for your convenience to be busy for other things at the same time. If you think you need more heat, dip hot water, wring a towel, wrap in hair so that the temperature can keep heating. Wait for 15 minutes and then flush away the hair care products. Use the towel to dry the hair half dry. And wipe on some hair care products that nourish the hair and allow the hair to form a protective layer! Blow dry the hair or wait for naturally dry. It would be great "deep conditioner" maintenance.